When does the First Month of Nissan (Aviv) Begin? 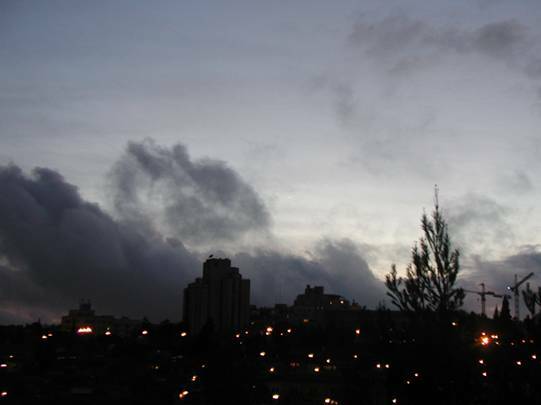 On March 11, 2005, Nisan 1, 5765, the New Moon was sighted over Jerusalem. It was so very faint but if you take a look closely in the center of the picture at the heading of this manuscript, you will behold the finger of the Eternal One of Israel as He sets His sign in the darkness of the heavens for anyone to behold. 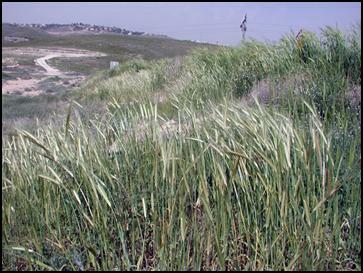 On Tuesday, March 8, 2005, the wild barley was found in Aviv (ripened sheaves) in the Land of Israel at Alon Junction and also at Ein Mabua 15 km. east of Jerusalem. Did the festivals of the Lord begin on this date? What was also noted on that same date, the “Aviv Searchers” in training found that the heads of barley grain were already in advance state of ripening. Later on March 11, 2005, the annual barley hunt was carried out in the Northern Negev region and along the Jordan Valley by the Karaite Jews. This is a sect of Judaism that is promoting the return to the Aviv (ripening) barley and the new moon sighting as a prelude to understanding the Torah rituals given to Moses and Aaron to begin the yearly festivals of the Lord in the Wilderness Tabernacle. Many have wondered, who governs the Calendar of the Lord? Would it not be reasonable to state that the God of Israel does? Yet we have a problem. On March 11, 2005, the sliver of the First Moon was sighted over Jerusalem. Even barley in the Land of Israel was found ripened to the stage that it could be called the “First Fruits” and be waved in the sanctuary or temple of the Lord on the Festival of First Fruits. With those two conditions in mind, would it not be reasonable to assume that on March 1, 2005 the Biblical Calendar of the Lord stated as the Jewish day, 1 Nisan, 5765. Well maybe not, because March 11, 2005 was before the Spring Equinox. Pentecost (Shavuot) - sunset May 14 to sunset May 15. 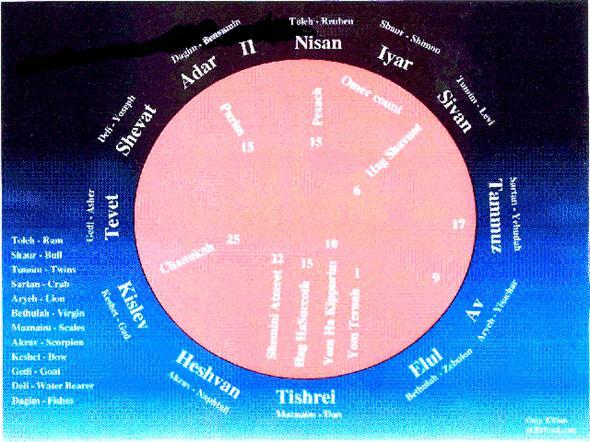 The year 2005 Spring Jewish calendar began with an interesting cluster of conflicts. Are we in a learning curve at this time? Then maybe we should take heed that out of conflict and dissent comes destructive discord or understanding and harmony. Out of conflict and dissent, when there is a ‘change of lifestyle with mental and spiritual orientation’, comes intimacy and fellowship with one another. 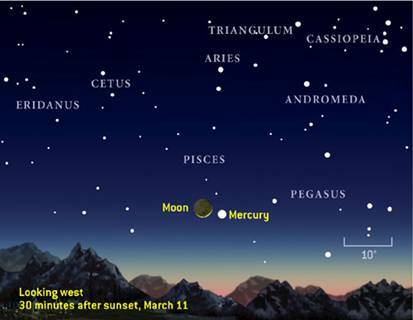 The illustration below shows the crescent New Moon and Mercury as seen from the United States at 30 minutes after sunset on March 11, 2005. The first conflict was that on your home calendar the calculated Jewish calendar for the Jewish year 5764 (2004-2005) was not scheduled to end until early April, 2005. The New Moon sighting was not scheduled to be visible until April 9 or 10, 2005. The official beginning of the calculated Jewish festival calendar was on the eve of April 11, 2005. On the eve of March 14, the Festival of Purim began with festivities on the eve and during the day of March 15, 2005, the reading of the Megilla of Esther was to be read. The calculated Jewish Festival of Passover (Pesach) began on the eve of April 24, 2004 during the full moon. If the early barley ripening and the timing of the sliver of the New Moon began the Biblical New Year on March 11, 2004, the festival of Purim would have had to have been cancelled. The Feast of Purim and the Festival of Passover were in conflict. So we ask, so what? Does it make any difference? So far, what it has made is dissent and confusion. On the evening of March 24, the Messianic Christian communities following the New Moons and Aviv (ripened) barley with the Karaite Jews celebrated the Passover (Pesach). On the evening of April 24, the Jewish people with many of the Nazarene Israelites are celebrating the Passover (Pesach). Not only is there great discord but out of the conflict comes the ultimate confusion, how can we follow the finger of the Lord as He prepares this world for the final drama in the Great Conflict between the Maschiach (Messiah) of Israel and haSatan (Satan) the arch-deceiver. Whereas the calendar of the festivals is based on a lunar calendar, the months of the calendar of the Jewish people before the Babylonian captivity were based upon the sun and not the moon. Only after the Jewish people returned back to the land of Israel did they convert the Solar calendar that began their New Years to a Lunar calendar. The pre-Babylonian Jewish calendar began the Jewish New Years in the Aviv when the barley was ripened at the spring or the vernal equinox. They recognized then as we recognize today that the most accurate time clock on earth was the sundial. It is on March 21st and September 23rd that modern time clocks are corrected with the sun today. To make calculations on whether our modern time pieces are ahead or behind the sun, high quality globes will have a figure eight diagram called the Analemma or the equation of time. Therefore the modern Gregorian calendar can be recalibrated and the time recalibrated to the Solar Equinox. Sometime after March 21st at the vernal equinox, the first day of the first month in the solar year began. How was the vernal equinox calibrated? The time between the day and the night was exactly even and could be observed by exact science on their sundials. To the ancients, the sun was the sign of the gods in the heavens and the early Hebrews agreed. The Eternal One of Israel set forth the greater light and it was there for the setting of days and seasons. They did not worry about whether a year was 364 ¼ days long, or whether a leap-year was needed to recalibrate their days and seasons. Their sundial never did need re-adjusting. There was no February 29 nor a lunar reckoning adjustment to the solar calendar of seven months every nineteen years. Whatever recalibration time was needed from one New Year to the next was by waiting during the time after the Spring solar equinox and the arrival of the sliver of the first moon of the lunar calendar. Today we notice that the moon calendar is about eleven days shorter than the solar calendar. The days of the week were known by numbers and not names. To name a day or a month by the names of the gods of their foreign oppressors, whether Babylonian or Roman, was and idea that was foreign to the authentic ancient Hebrew. Since the Creator of the Universe set the sun and the stars to be the governors for the solar order of calendars in the 4th day of Creation, the early Israelites started the counting of the days of the week on the Fourth day, the day we know as Wednesday. The menorah was the typology of the daily counting. The Seventh day Sabbath (Shabbat) was called the Crown of Shabbat or at the center or highest candle shaft of the menorah. The days then began the descent in order: First day (Sunday), Second day (Monday), Third day (Tuesday). Then the days began three days of ascent to the Crown of the Seventh-day Shabbat: Fourth day (Wednesday), Fifth day (Thursday) and the Sixth day (Friday). Instead of the Eternal Circle of Eastern Mysticism which has no progression of time, the Hebrew concept of the progression of time was in a bio-rhythm or a wave formation with the highest elevation of mental ascent on the Seventh-day Shabbat (Sabbath). Such was the advance stage of Hebrew thought. Before the Babylonian captivity, the months of the year were called by number and not names. As with the day, the ancient Hebrews did not use the names of the gods of their oppressors to calculate the months or days of the year. As noted above the Hebrew New Years started after the Spring Equinox when calculations of the month began with the sliver of the New Moon. It was not until after the Babylonian exile that the first month at Aviv (Abib) when the barley was in Aviv (ripened sheaves) began with the sighting of the sliver of the first moon. At this time the ancient Solar calendar was converted to a Lunar calendar. Only after the Babylonian captivity did the Seventh month become Tishri and Rosh HaShanah, 1 Tishri, became the beginning of the New Year. Beginning after the Fall Equinox, the number of the month was given a name according to the Babylonian gods of their captors. These Babylonian names are: Tishri (7th), Hesvan (8th), Kislev (9th), Tevet (10th), Shevat (11th), Adar (12th), Nisan (1st), Iyar (2nd), Sivan (3rd), Tammuz (4th), Av (5th) and Elul (6th). Yet the Babylonian gods were not what the Creator of the Universe desired that His people recognize their time by. The Hebrew monthly calendar was calculated according to the “gates” in the heavens, the constellations of the Zodiac or the Mazzaroth. The procession of the Mazzaroth (Zodiac) followed the gates of the sun. The tribes of Israel were each given a gate or a constellation in which their tribal identity would be identified. It was this Mazzaroth that was imbedded in the story of the Plan of Salvation. Without an understanding of the Hebrew calendar and its adaptations or corruptions over time, we loose out the vast reservoir of meaning in its application. The first major corruption of the Jewish calendar occurred after the Babylonian captivity. It was not Ezra or Nehemiah who instituted the corruption but this came in the days of the Maccabees, after the Abomination of Desolation of the temple by Antiochus Epiphanes IV. In the days of the Essenes, who were called, the Ishiyim, they went into exile or separated themselves from the Pharisees in Jerusalem which they felt were corrupt and the priests of the temple who were not of the Biblical lineage of Zadok, the high priest of King David. In the MMT document found at Qumran are found twenty four charges by the Priest of Qumran (Succaccah) against the “wicked” priest at Jerusalem. In these accusations was one which charged that the temple priests in Jerusalem used the Babylonian Lunar Calendar and thereby the holy days or the days of the festivals of the Lord fell on the wrong dates. At Qumran, the largest number of fragments from any one book was the Book of Enoch which used the solar calendar. Also in Qumran, eighteen copies of the Sefer Jubilees (Book of Jubilees) in which the Jubilee calendar is calculated by the solar calendar. This corruption was later seen in our more modern calendars. The calendar of our modern world is the Gregorian calendar which was adapted off the Roman Julian calendar in which the days and months of the year are names after pagan deities. Let us note with certainty, these calendar changes have nothing to do with astrology or astronomy. The Gregorian calendar changes have everything to do with theology. They wanted to change the message of the Jewish calendar in order to set up new theological framework of religious life. When they changed the “times and the laws”, by changing the names of the calendar, they were instituting a competing religious system to Torah. How did this happen? The dating of the Gregorian calendar was determined by the Roman Catholic monks and is centered on the date of Jesus’ birth. The B.C. dates were “before Christ” and the A.D. dates were called Anno Domoni which in Latin means the “year of our Lord”. The fact that these dates are conjectural is well known in that they are centered around the date that they believed Jesus was born, which history has shown to be flawed data. This miscalculation was known when new dating on the death of Herod the Great is now known to be in 4 B.C. This leaves the date for Yahshua’s birth to come before the death of Herod the Great and upwards to one or two years before that time. Many arguments are made as to whether the ripening of the barley is even a determining factor in the calculation of the 1st month of the Jewish calendar. At the time of the Israelite’s wilderness experience with Moses and Aaron at Sinai and in the desert wandering, we glean several impressions. The barley ripening is not by Torah command directly but only indirectly. In order for the waving of the ‘first fruits sheaves” to be waved before the altar of the Lord in the tabernacle or temple on the 15th day of the 1st month (Aviv or Nisan), the barley must be ripe. If not the Festival of First Fruits cannot begin. The second supposition is that the Jews could not participate in the “waving of the first fruits” unless they had a temple with priests and a reigning high priest. The “stages of growth” of the barley is immaterial in that growth patterns would be different in Egypt, the wilderness of Sinai or Arabia and even in Israel. This year the barley was ripen near Jerusalem and Jordan but not in the Negev. 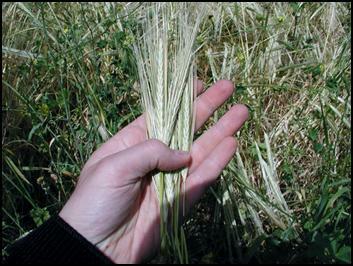 Then they had to consider, was the maturation different between domesticated barley and the wild barley. In the days of the diaspora at the time of Yahshua (Jesus), if a Jew were to wait until word transferred across the Roman Empire that the barley was ripen, they could not arrive in Jerusalem fifteen days later to participate in the Festival of Pesach (Passover). The change of the ancient Hebrew calendar from solar to lunar has been argued to have occurred at the time of Ezra and Nehemiah. If we understand the bitter animosity between the Essenes and the Pharisees of Herod’s temple, we understand that this calendar change came after the abomination of desolation by Antiochus Epiphanes IV during the era of the Maccabees. This would suggest that the Passover dates for the Pesach Lamb at Passover during the crucifixion and death of Jesus could have been off cycle if the festival season began before the Spring solar equinox. Taking a global view, was the Lord of hosts preparing his people to flawlessly follow a ritual festival or were they to develop a deeper mystical and literal understanding that being ‘on time with the God of Israel’ was critical in our relationship with Him. Is the understanding centered on ritual perfection or understanding the meaning of ‘perfect’ timing according to the authentic calendar of the Lord? Did this same understanding have a dual application with the worship on the Seventh-day Sabbath (Shabbat)? If you want to worship with the Lord of hosts and He establishes a rhythm of cycle of worship, then if we worship on the 6th day (Friday) or the 1st day (Sunday), we are not only out of synch with the timing of the nearness of His presence, we very well may miss out of the power and depth of His presence. It appears that the Lord of hosts has a pattern of relationship when His presence comes nearest to us. If we miss the timing of His presence, we miss the richness of His blessings. At the same time, the festivals of the Lord were instituted especially for two epochs of human history. The first epoch was the life and death of the Maschiach (Messiah) at His first coming forty years before the destruction of the temple of the Lord in Jerusalem. The second epoch in human history is still in the future, the time of the end when the “saint” and “holy ones of Israel” are awaiting the arrival of the Maschiach of Israel. Concerning the first epoch, the historical evidence shows that Yahshua ben Yosef (Jesus son of Joseph) was conceived on the 25th of Kislev as the ‘miracle’ of the Festival of Lights. He was born nine months later on the first day of the Festival of Tabernacles (Succot) when the son of the Eternal One of Israel came down to ‘tabernacle’ and to dwell among men. He started His ministry in Galilee again at Succot during the Sabbatical week of years when the land was fallow and all Jewish men took a year off to mentor under a rabbi. Then three and one-half years later He died on the 14th of Aviv (Nisan) as the literal Pesach Lamb of God. He rose from the grave on the first day of the Festival of First Fruits and became the first of the “first of the first fruits that will arise from the dead at the sound of the trumpet”. He then ascended to His Father after the forty days of Omar just in time for the arrival of the Ruach HaKodesh (Holy Spirit) at Pentecost (Shavuot). If the timing of the festivals of the Lord is of no consequence then why does the historical evidence depict otherwise. Were not the Jewish people reenacting these festivals every year? Were they to learn to conduct ‘perfect’ rituals or was it of more import that they might have insight and wisdom so that they might develop ‘eyes that can see’ and ‘ears that can hear’? All through the ministry of Yahshua (Jesus) we see the various stages of growth and development of the talmidim (disciples) of Yahshua (Jesus). When they later became His emissaries (apostles), they ‘knew’ and ‘understood’ and as such withstood the tests and trials and tribulations that they had to endure in their witness and testimony of their Maschiach (messiah). Yahshua (Jesus) did not pound into them ‘ritual perfection’ but the essence of ‘knowing’. What about now? Does it matter for those of us living at the time of the end that the timing of the festivals is correct? What we have learned to this date is that the Oslo Accord between the Nation of Israel and Arafat’s Palestinian Liberation Organization (PLO) was exactly for seven years according to the ancient timing of the festival calendar of the Lord. No, this would not be understood by using the calculated Jewish calendar used by orthodox and reform Jews today. It was only understood by using the sliver of the first moon and the Aviv barley to calculate when the beginning of the festival season began on 1 Nisan. The Oslo Accord was signed on Rosh Hashanah 1993 and was effectively voided on Rosh Hashanah 2000 when Ariel Sharon went up to the Temple Mount as the candidate for the Prime Minister and read the Gog-Magog chapter of Ezekiel and Arafat’s Intifada started on that day. The shadow pictures of the Fall festivals of the Lord have been known by the sages of Judaism to portray the return of the Maschiach of Israel. For the believers in the messiahship of Yahshua (Jesus), this then suggests that a full understanding of the second coming of Yahshua is imbedded in the typology of Rosh Hashanah, Yom Kippur and Succot. It suggests that the fullness of the high priest ministry of Yahshua will be heralded by the sounding of the 7th and final shofar of the Lord during the last trumpet and vial plaque as portrayed by the Yohannes (John) the prophet of Revelation. As the high priest went from the Holy Place in the tabernacle or temple into the Holy of Holiest, ten days later on Yom Kippur on the Day of Judgment so also Yahshua will enter the Holy of Holiest of the heavenly tabernacle and present to His Father, the Eternal One of Israel, the final culmination of the blood of His blood and sacrifice as the Passover (Pesach) Lamb and the sacrificial ram at Yom Kippur. He will then offer the Torah fulfillment of His ascension to heaven on the first day of the ‘waving’ of the first fruits of the barley harvest as the “first fruits of the resurrected.” The He will present His case to His Father of His ministry over the last two millenniums as the high priest after the order of Melchizedek. With the acceptance of His Father’s will, His atonement will be complete. He will emerge from the Holy of Holiest not as the high priest but adorned in white as the “King of kings and the Lord of lords”. Within the next five days, from Yom Kippur to Succot, during the brightness of the full moon, He will return to battle Satan, the forces of darkness, the anti-Maschiach (anti-Christ) and the demonic controlled forces of the Golden, Red and Black Internationale who will combine their military might to assault heavenly forces of Yahshua returning into this earth’s dimensional sphere. There the mightiest armada and military forces of the nations of this earth will congregated in the plains of Megiddo and surrounding Jerusalem. BibleSearcher scans the world for information that has relevance on the time of the end and can allow the believers in the Almighty One of Israel to “watch and be ready”. Our readiness has nothing to do trying to halt the progression of evil or good on our planet earth but to be prepared for the coming of the Messiah of Israel. Our preparation is a pathway of spiritual readiness. Our defense is with the Lord of hosts. The time of the end suggests that the Eternal One of Israel’s intent is to close out the chapter of this earth’s history so that the perpetrators of evil, those that seek power, greed and control, will be eliminated from this planet earth. The wars of the heavens are being played out on this planet earth of which humans on this earth will live through it to testify of the might, power, justice and the love of the God of Israel. In a world of corruption and disinformation, we cannot always tell who is telling the truth or who is spreading lies, promoting evil or mis-information. We cannot guarantee our sources but will always seek to portray trends that can be validated in the testimony of the prophets of the Old and the New Testament.